RFK, Jr. leads a call for awareness of the vile and violent bigoted philosophies that informs Palin's small town conservatism. Fascist writer Westbrook Pegler, an avowed racist who Sarah Palin approvingly quoted in her acceptance speech for the moral superiority of small town values, expressed his fervent hope about my father, Robert F. Kennedy, as he contemplated his own run for the presidency in 1965, that "some white patriot of the Southern tier will spatter his spoonful of brains in public premises before the snow flies." "Sarah Palin never asked anyone to ban a book as Mayor. As Mayor -- of a Wal-Mart and a snowmobile trail -- she was only interested in censorship in general. 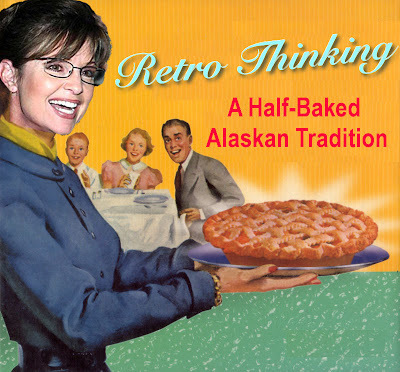 Why was it so important for Brian Rogers to slip in the words "as Mayor" a week ago, before anyone had heard about Sarah Palin's city council campaign to protect Alaska from Daddy's Roommate?" I no longer have any tolerance for hair splitting truth tellers who are micro-meters from lies in order to further their goals through deception. Vile, lying, neo-con, fundamentalists who would impose their narrow, violent, sexist, biogoted world view on us all. Eff em. This is war. I'm declaring war on fundamentalism -- all fundamentalism descended from the intolerance of Abraham's world view -- Christian, Islamic, or Judaic. RNC protest - it's a wrap. There is so much that didn't make it in to the corporate media -- I don't know where to begin. So I will start with CODEPINK. It is interesting to note that the dark blond woman who had the banner ripped out of her hands is a constituent of John McCain who knows he has done nothing for the people of Arizona although he has helped corporate Arizona -- and with the trickle down effect has p---ed all over the people of Arizona. The night before Medea and Jodie engaged in a free speech act at Palin's speech. A very Republican friend of mine summarized his reaction to the free speech engaged in by Liz and Nancy last night during the McCain speech after I distributed a URL to AP coverage of my pink sisters that lands at a video of the event near the spot on the page where the speech act is accessible under the heading "Protest...." I find it interesting that I couldn't link directly to the proper video. Oh well. "I KNEW it. You CodePinksters are a resourceful, albeit deeply irritating (but that is the point, after all, isn't it?) lot! Though I disagree with your group's policy prescriptions, I am glad to see someone was able to penetrate the unconstitutional barriers to free speech both parties erected on the pretext of security concerns. I only wonder why Code Pink did not crash the love fest at Mile High Stadium, also, or did they but went unheard in such a massive, outdoor venue?" You can see that Pinksters interupt Obama too in the video immediately above. CODEPINK actions at the RNC on Flickr. I believe the Make Out Not War action best captured the spirit of CODEPINK - presenting the other side of the coin per the war in and occupation of Iraq in a non-violent jester inspired manner that can even make people laugh until they stop and think deeply about the action -- then tears are likely. Things were not quite as peachy for journalists engaging in what is supposed to be doubly protected reporting through free speech acts instances of free speech acts. Amy Goodman was arrested when asking to speak to a police officer in charge so as to find out where the cops in Darth Vader suits had taken two of her producers they had arrested. I recommend watching the entire program to get a feel for the abuse of power that went on throughout the entire RNC. Amy Goodman got the most attention of the group but several other journalists were detained, arrested, and charged with very serious misdemeanors or felonies. If you don't have time to watch the entire video -- go to the end so you can see a reporter summarize another event where the police were way out of line to begin with... but then exaccerbated the situation by rounding up the journalists too. This doesn't even begin to cover the huge number of other outrageous acts instigated by the police. Here are links to just a few. Pepper spray directed directly and purposesively into the eyes of a photojournalist. From the blogosphere, Pam's House Blend covers the situation well. Here's the photo of police abuse of a protester that got the photographer arrested. This could have broken the protester's neck or crushed his throat. More than 50,000 have already signed on to a petition delivered today to St. Paul City Hall to have charges against journalists dropped. Photography is not a crime discussion on flickr is worth checking out. So is this about photographer's rights. And then there are the hundreds of arrests that even CNN finds used questionable tactics as well as pre-emptive search and seizures. And then there was the arrest of a photographer last week at the DNC who took a pic of a democratic honcho and some big donors who was arrested -- that must have been a warm up.